From the makers of Satya Sai Baba Nag Champa incense. 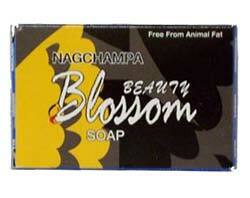 Nag Champa Beauty Blossom soap has a pleasant fragrance which invokes freshness and calmness to mind and body. The olive oil in this fine bar helps make the skin glow., 70gr. bar. This soap is an excellent skin toner, cleanser and mosturizer.